The ultimate DLNA home media server software that streams music, video, movies, TV shows and photos from your PC to your TV, games console and DLNA digital media appliances. Works with TVs, PS3, Xbox 360 and digital media devices from Sony, Samsung, Panasonic, Toshiba, LG, D-Link, Buffalo, and many more. Automatically scans your computer for music, video and photos. Import from iPhone, iPod and iTunes. Transcodes to all popular file formats. 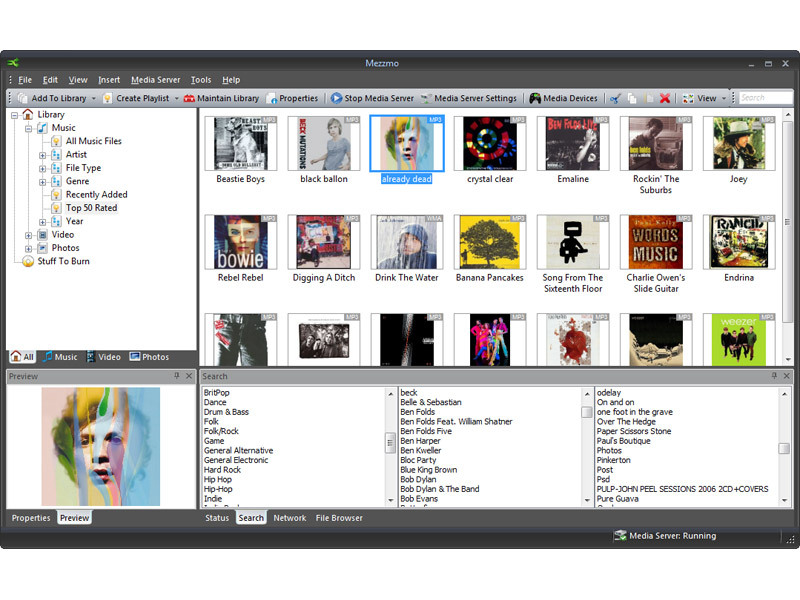 The ultimate DLNA home media server software streams music, video & photos. ...... and digital media players from Sony, Toshiba, Samsung, Panasonic, D-Link, Buffalo, Netgear, Logitech, Pinnacle and many more. Mezzmo is easy to set up and use. Mezzmo automatically finds and organizes all your music, movies and photos on your computer. Import music, movies, photos and playlists from your iPhone, iPod, Audio CDs, iTunes, Windows Media Player and WinAmp. Mezzmo transcodes music, movies and photos on-the-fly so they play perfectly on your DLNA-enabled device. Multi-threaded technology and support for the latest Dual Core, Quad Core or higher PC systems gives you fast transcoding and super-fast streaming. Media format support includes all popular video file formats, music file formats and image file formats. You can even connect and stream to multiple devices at the same time. Install Mezzmo onto your PC today and start streaming music, movies and photos to all your DLNA-enabled devices in your home. Qweas is providing links to Mezzmo 2.7.1.0 as a courtesy, and makes no representations regarding Mezzmo or any other applications or any information related thereto. Any questions, complaints or claims regarding this application Mezzmo 2.7.1.0 must be directed to the appropriate software vendor. You may click the publisher link of Mezzmo on the top of this page to get more details about the vendor.